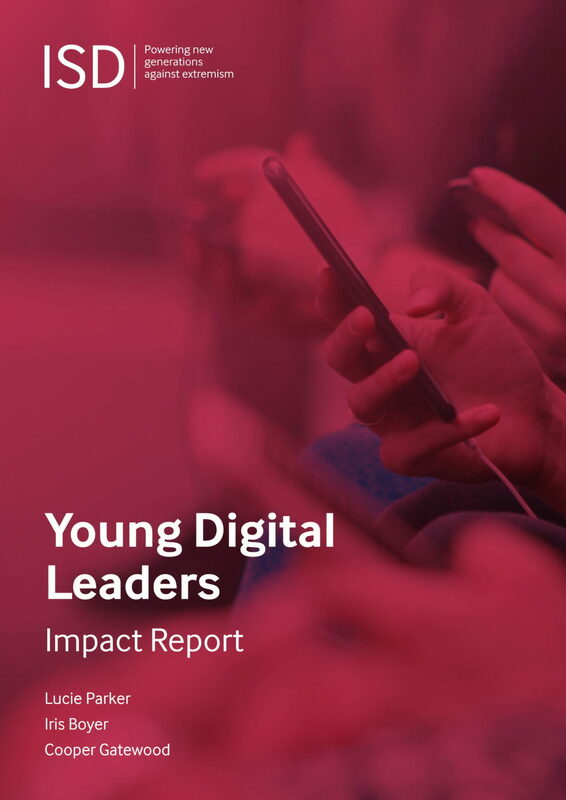 This report presents the findings from our Young Digital Leaders project which was designed to equip young people aged between 13-16 years old in Italy, Romania and Sweden with the skills they need to be safe, powerful and effective online citizens in the 21st century, and to explore new ways of teaching digital citizenship in formal educational settings in Europe. The project pioneered a unique, collaborative partnership model between students, teachers, parents and local civil society organisations. The project, piloted by Google and ISD, used trained local facilitators to deliver one-day workshops covering a range of social challenges relating to the online world, including fake news and propaganda, echo chambers, emotional manipulation and hate speech. 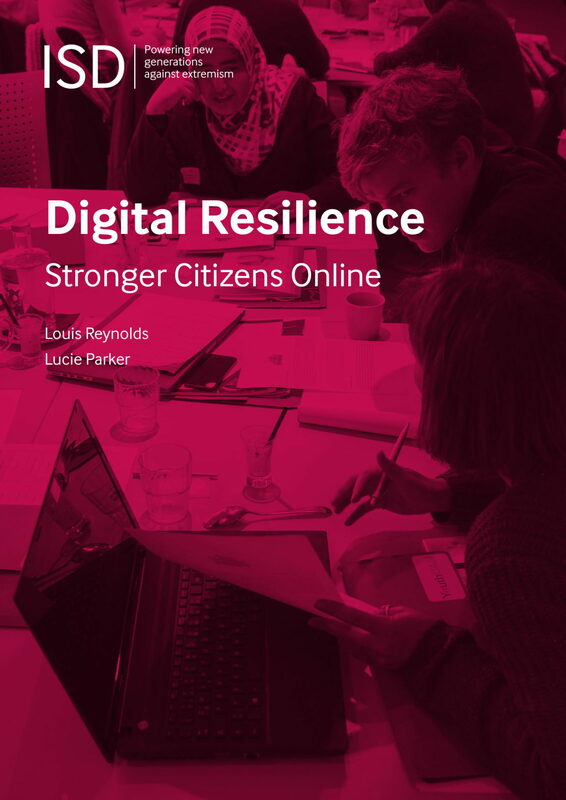 This report demonstrates the effectiveness of parent education and citizenship and the need for digital resilience training and education to be embedded within national curricula and delivered regularly over a longer period of time to a wider age group. Hate Speech and Radicalisation in the Network, published by the Online Civil Courage Initiative (OCCI), a programme of ISD and Facebook, brings together a variety of interdisciplinary perspectives to explore the prevalence of hate speech on social media, the strategies and tactics of Islamist and far-right extremist groups online, the potential impact of disinformation on political polarisation and radicalisation, and how government, the private sector and civil society can respond to these challenges. 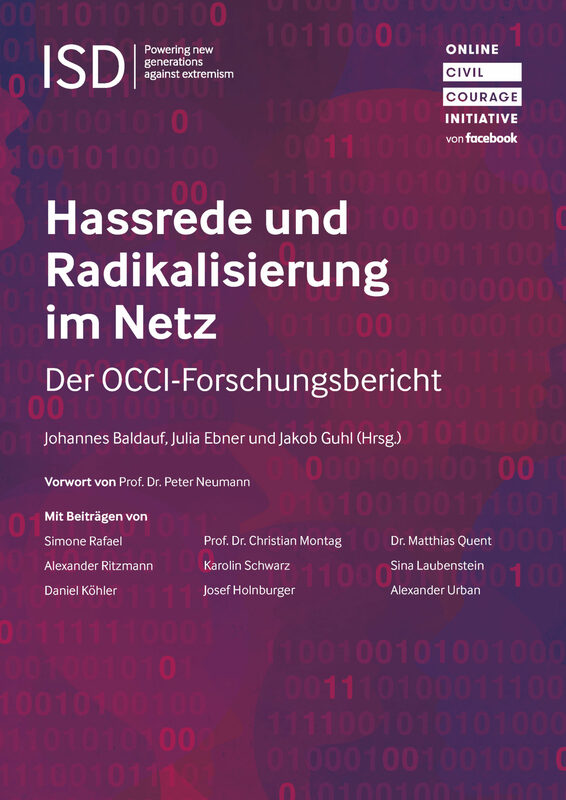 The report also looks at the role of disinformation in furthering the spread of hate speech and extremist perspectives online, fuelling polarisation, and disrupting democratic elections. It highlights the need for social media companies to continue to provide access to data on the origins, reach and impact of disinformation, and for tech companies to continue to work closely with journalists and fact-checking organisations. The report brings together voices from a variety of backgrounds and fields of expertise, including contributions from Peter Neumann, Julia Ebner, Matthias Quent, and Karolin Schwarz. This joint report by ISD and German campaign group, ‘Ich Bin Hier’, maps the rise and nature of far-right hate speech in Germany. It combines quantitative data-analysis from Facebook comment sections with insights gained from ethnographic research in far-right chat groups. The report demonstrates that a relatively small portion of highly active users are responsible for a disproportionate amount of hateful far-right online content. The findings strongly suggest that far-right trolls use sophisticated media strategies to spread hate campaigns online. A small, but well-coordinated network of far-right accounts are therefore able to mainstream their ideas by influencing media reporting, and in turn, public debate by creating a false impression of representing a wider portion of society than they actually do. This report calls on data from the largest collection of interviews with foreign fighters and those closest to them. It combines data from open-ended interviews with 43 parents, siblings, and friends of 30 men and women who travelled to Syria and Iraq. The findings and insights of this report examine two issues. 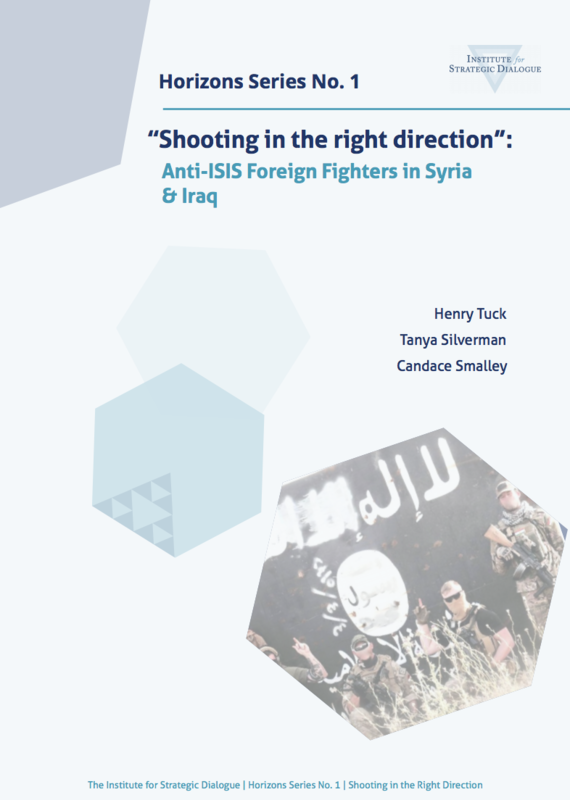 Firstly, the report sheds light on the motivations of the thousands of foreign fighters who left their families, homes, and lives to fight for jihadist groups since the start of the Syrian civil war. Secondly, it provides insight into the difficulties which families of foreign fighters face when coming to terms with their loss. It examines common factors between foreign fighters, the process of radicalisation, and whether they had contact with their families once they made the hijrah (migration) to Syria. 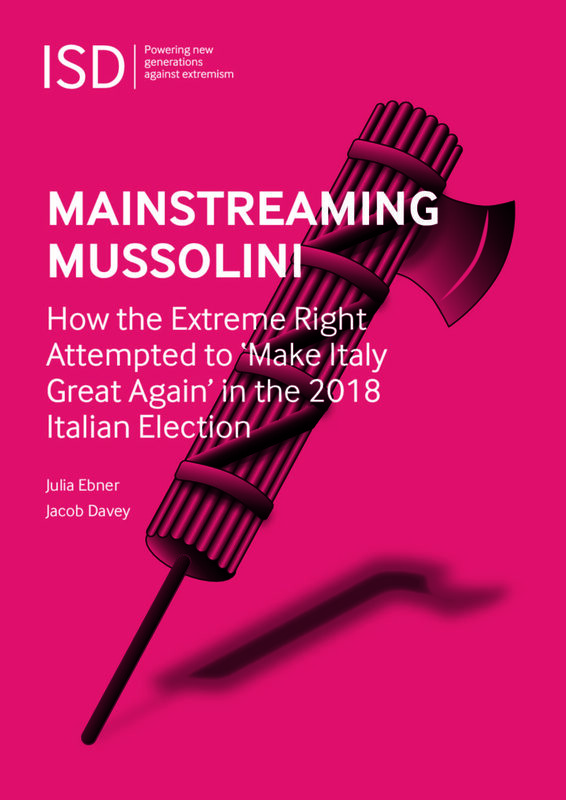 This briefing paper documents attempts by Italian extreme-right activists to influence the recent Italian elections in their favour. It highlights how these activists are adopting an increasingly international perspective, influencing and being influenced by the international alt-right, and adopting tactics similar to those deployed in recent European elections, including the German election. The research is based on a combination of social media analysis and six weeks of research inside over a dozen Italian extreme-right encrypted chats and channels on Telegram and Whatsapp. These included neo-fascist and white nationalist Italian language groups such as ’/mas/’, ‘L’eco sansepolcrista’, Sinistra Nazionale’, ‘La Voce del 1919’, ‘Onda Italico’, ‘Fvtvrismo’, ‘Biblioteca Apocrifa’, ‘Magazzino nfografico’, ‘Noi, fascisti’, ‘Casapound Italia Basilicata’ as well as multi-language channels such as ‘Defend Europa News’ and ‘Il Quadrato – Per l’internazionale Rivoluzione Fascismo’. 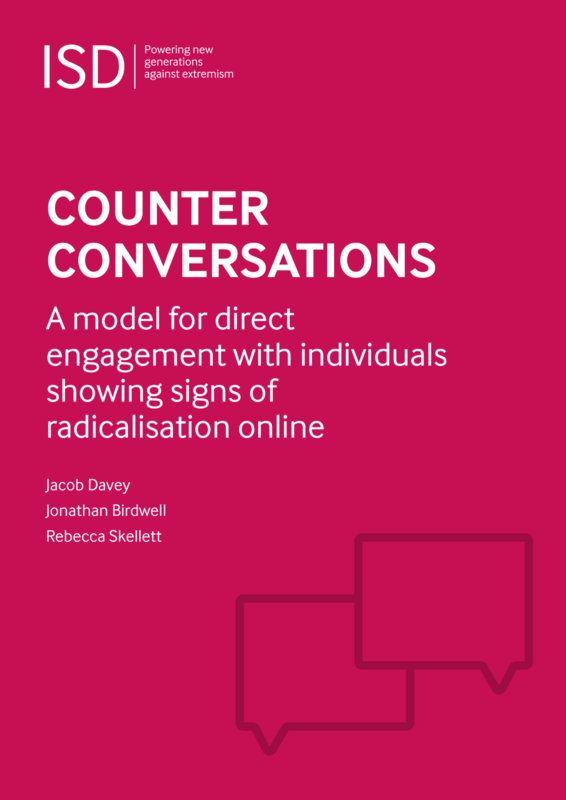 ISD’s Counter Conversations programme is an experimental approach designed to fill a gap in our response to online extremism by testing if the methods deployed in offline interventions can be brought into the social media domain. Direct engagement with radicalising individuals by mentors and ‘intervention providers’ is now a well established component of offline counter-terrorism efforts in a number of countries. These programmes are delivered by both government and civil society, and often include former extremists and social workers as intervention providers. Until now, online prevention efforts have largely focused either on the removal of terrorist content or on the production and dissemination of counter-narrative and counter-speech campaigns to compete with extremist propaganda. However, there have been no systematised attempts to supplement counter-speech efforts with direct online messaging and engagement at scale. The results demonstrate the positive potential of direct online engagements and point to the need for further exploration into how this model can be deployed in a responsible, effective and scaled fashion, as part of a suite of online risk reduction methodologies. 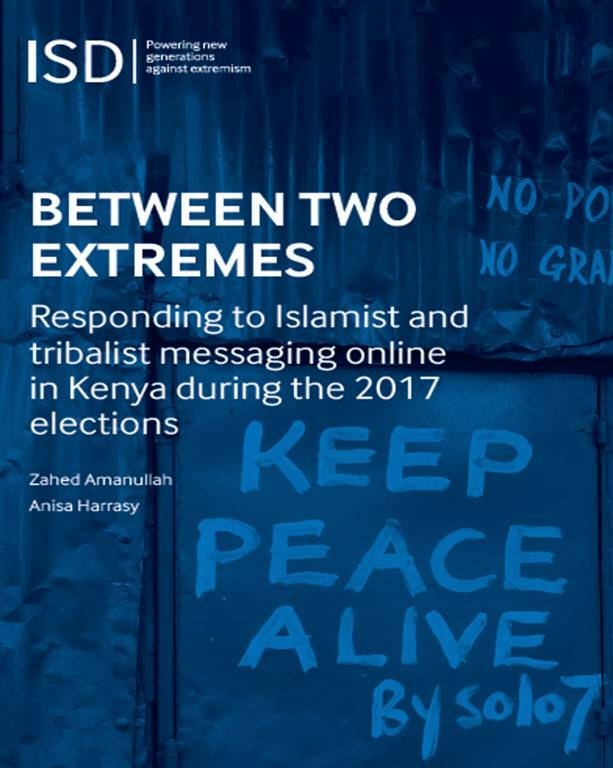 This report reviews the state of extremist discourse and propaganda techniques used across the Kenyan social media landscape and share the results of a 16-month long study conducted to understand the capacity of Kenyan community service organisations (CSOs) to adapt to this changing landscape. With the assistance of Google/YouTube, Facebook, and Twitter, ISD helped train over twenty peacebuilding CSOs in online counter-narrative creation, in both Swahili and English. The aim of this training was to equip CSOs with the tools and skills to compete effectively with those trying to promote extremism and division online. We shared techniques for targeting, distributing, and evaluating the content, looking at ways to maximise reach, engagement, and impact. 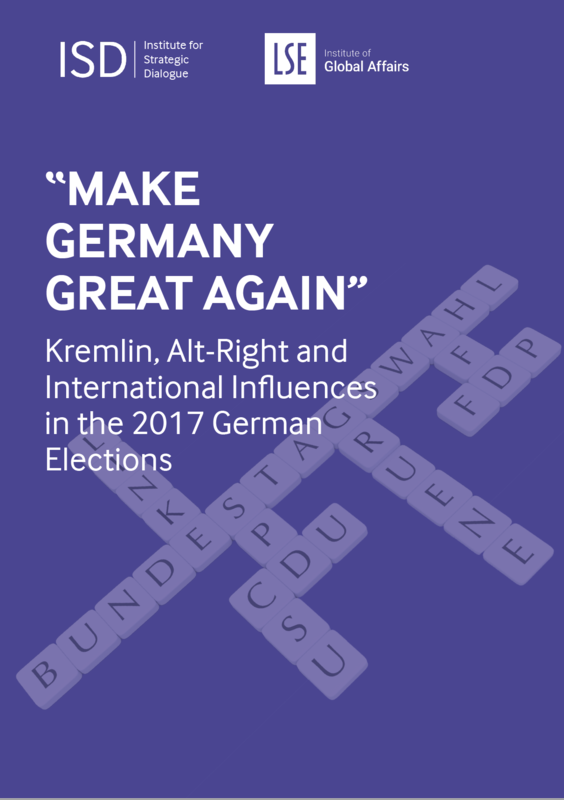 This report presents the findings of a project run with partners from the Arena Project, part of the Institute for Global Affairs at LSE, that investigated Kremlin and other foreign attempts to influence the 2017 German elections. The project uncovered the tactics and narratives employed by Kremlin-sponsored media, pro-Kremlin social media networks and the international alt right to distort political discourse during the election campaign period. The report explores how these efforts differed across three audiences in Germany: the nationalist right, the left wing and the Russian-speaking population. Through a mixed methodology that included social media analysis, investigative journalism and broadcast media monitoring, the report demonstrates the coordination of attempts to manipulate the debate between the online and offline. The report provides recommendations for steps that can be taken by domestic and international civil society, policymakers, and media in order to build a proportional and effective response to these efforts. 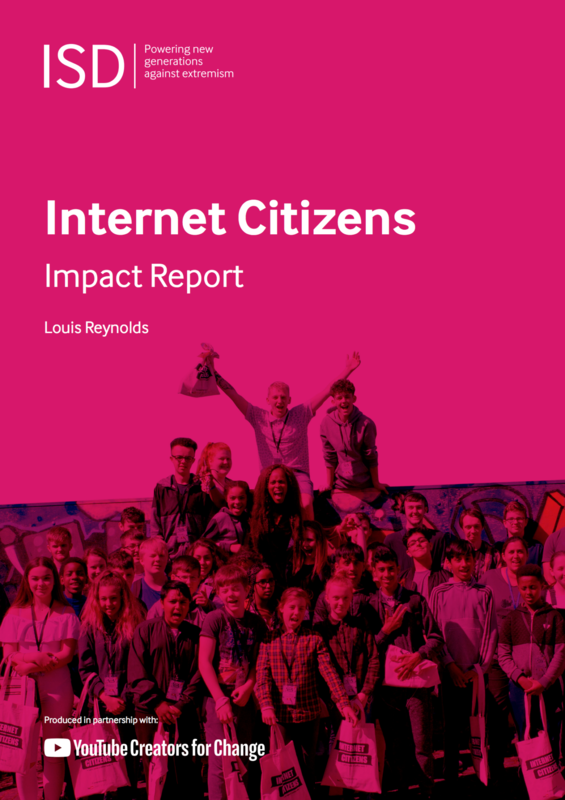 This report presents the evaluation of the the first phase of ISD’s Internet Citizens, which took place in 17 youth centres, reaching 500 young people and around 75 youth workers. The project, run in partnership with Google, UK Youth, Livity, Wonder and ISD, is designed to teach media literacy, critical thinking and digital citizenship, and to encourage young people to be positive voices online while increasing their resilience to hate and extremism. It also helps give participants the confidence to use platforms like YouTube to express their identities, as empowered producers and not just consumers of content. This report describes why this project and projects like it are so necessary, presents why it was created, and outlines its theory of change. It presents our reflections on Internet Citizens, and closes with a series of recommendations for future work in this area. 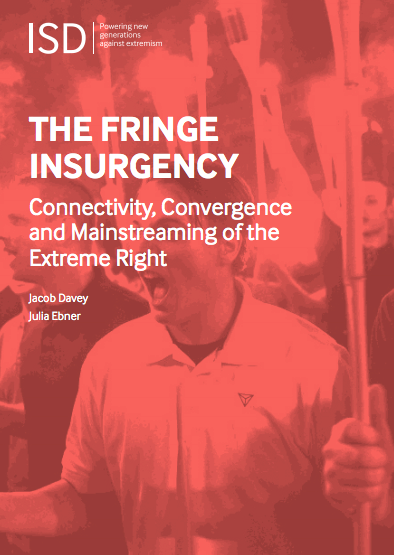 This report maps the ecosystem of the burgeoning ‘new’ extreme right across Europe and the US, which is characterised by its international outlook, technological sophistication, and overtures to groups outside of the traditional recruitment pool for the extreme-right. This movement is marked by its opportunistic pragmatism, seeing movements which hold seemingly contradictory ideologies share a bed for the sake of achieving common goals. 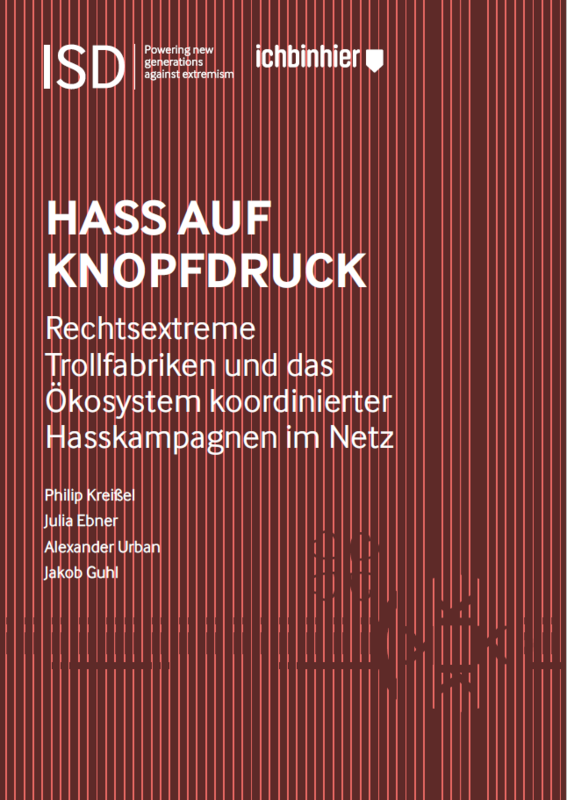 It examines points of connectivity and collaboration between disparate groups and assesses the interplay between different extreme-right movements, key influencers and subcultures both online and offline. Given the proliferation of violent extremist content online in recent years, developing effective counter-narratives – messages that offer a positive alternative to extremist propaganda, or deconstruct or delegitimise extremist narratives and challenge extremist ideologies – is an increasingly necessary alternative to online censorship. This Handbook has been funded with support from the European Commission. 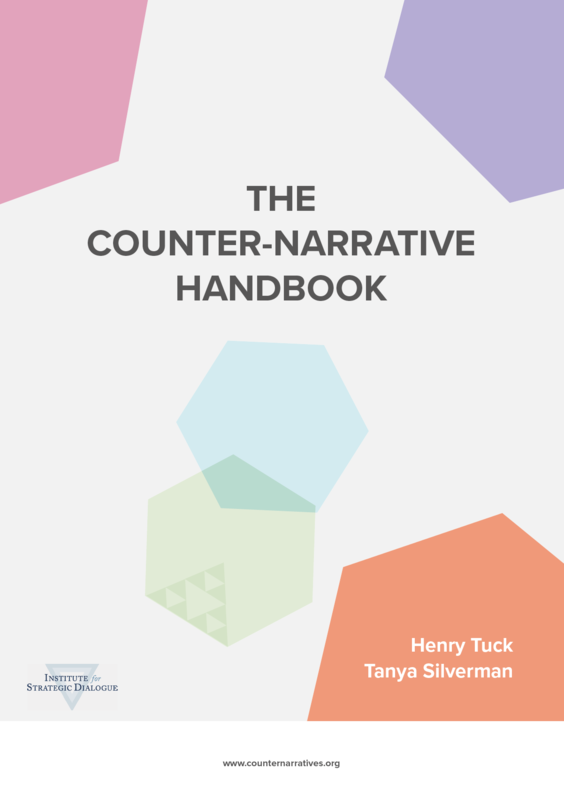 It was created by the Institute for Strategic Dialogue (ISD) to help anyone looking to evaluate their counter-narrative campaigns, and is intended as a beginner’s guide for those with little or no previous experience of counter-narrative campaign evaluation. It can also be used alongside ISD’s freely available online Counter-narrative Toolkit and ISD’s Counter Narrative Handbook. Bridging Transatlantic Voices is a civil society dialogue project funded by the European Commission’s Foreign Policy Instrument. The programme focuses on civil society efforts in countering violent extremism (CVE). Over three years (2015-2018), the British Council with partners from Georgia State University and the Institute for Strategic Dialogue will hold six workshops in six cities on this subject. The project will also produce a total of three reports containing sector-wide, civil society and policy recommendations for the European Union and major CVE organisations and government entities to utilise in their efforts towards this widely popular issue of countering violent extremism. This first report was released in September 2016 and is authored by scholars at Georgia State University. This report represents the first publication in ISD’s new “Horizons” series, launched to examine emerging trends related to violent extremism or CVE. Whilst the term “foreign fighter” is commonly associated with these individuals joining ISIS and other extreme Islamist groups, there has been far less attention on the hundreds of other foreign fighters that have travelled to fight against ISIS. This report builds on ISD’s research into the Islamist foreign fighter and female migrant phenomenon, and is based on a dataset of 300 anti-ISIS foreign fighters. It sheds light on this understudied group, examining who they are, who they are fighting with, and why they are prepared to participate in a far-away conflict. It also considers the legal frameworks of the countries providing the largest numbers of anti-ISIS fighters and the possible future implications for the fighters themselves, as well as their national governments. The concept of creating counter-narrative in order to push back against extremist recruitment and propaganda has become well established in recent years. In practice, however, it has proven difficult to curate this content in a systematic way, target it toward at risk audiences, and – most importantly – measure constructive impact on their behaviour. 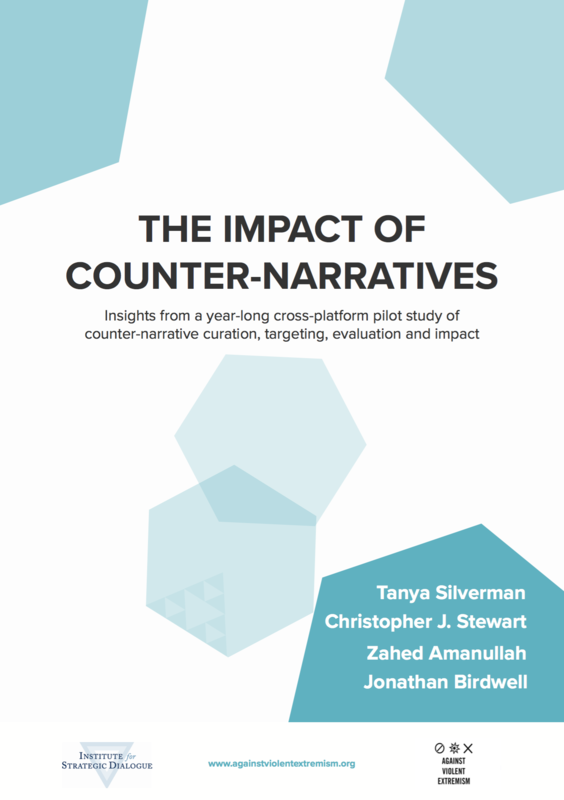 ISD’s Impact of Counter Narratives report presents the development, deployment, and evaluation of three counter- narrative campaigns orchestrated by the Against Violent Extremism network and Jigsaw (an incubator within Alphabet that uses technology to address geopolitical issues) with additional in-kind and financial support from Facebook and Twitter. The report provides fresh evidence that social media campaigns can help spark de-radicalisation. 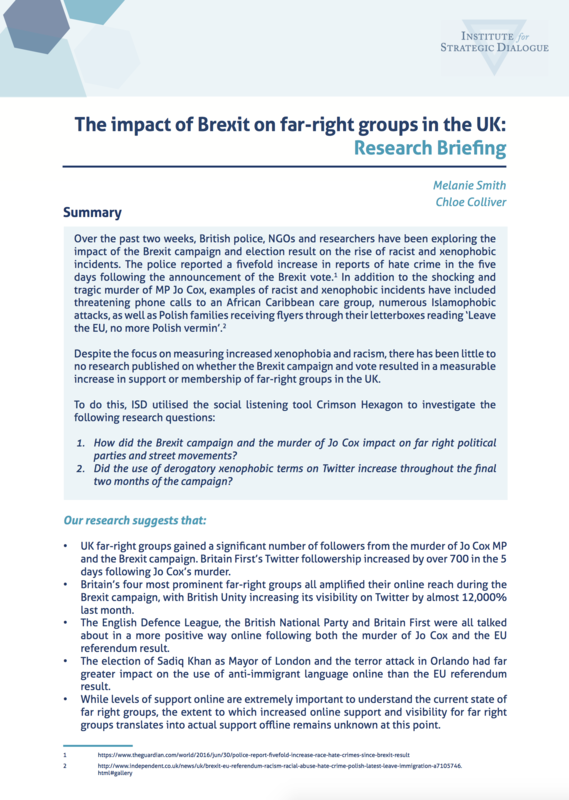 This research briefing uncovers the impact of both the announcement of the Brexit vote and the murder of Jo Cox MP on UK far right groups. Despite huge press attention on the issues of xenophobia and racism following the Brexit vote, very little research has emerged to show how the result has affected levels of support for existing far right political parties and street movements like ‘Britain First’ or the ‘English Defence League.’ Monitoring and analysing the presence of these groups on Twitter shows that followership of all of the five groups studied increased following these two events. This study also investigated the use of derogatory xenophobic language on Twitter over the last two months, revealing that the election of Sadiq Khan as Mayor of London and the Orlando terror attacks had a much more significant impact than the Brexit result. The following publication discusses the development, implementation and evaluation of Youth Innovation Labs. 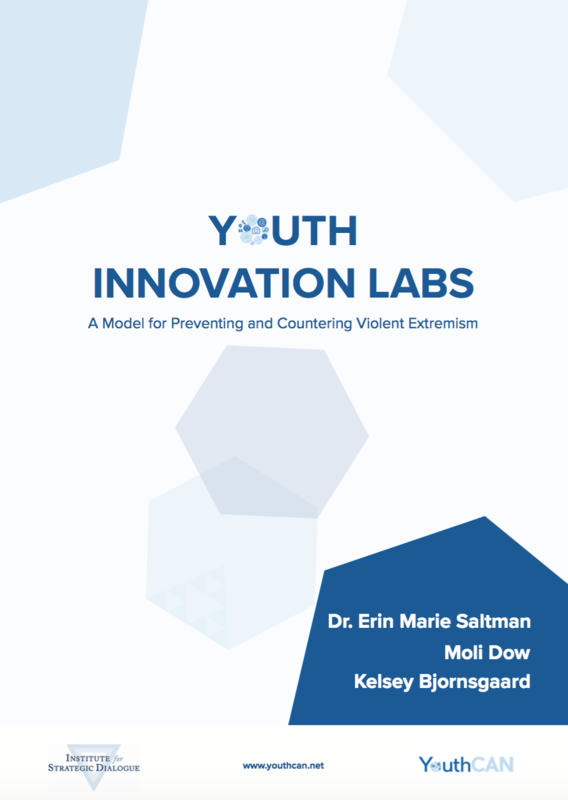 Labs are immersive, activist-led events that create a secure environment to facilitate capacity-building while giving participants the contacts, tools and resources needed to develop strategic campaigns for preventing and countering violent extremism. The purpose of this publication is to share the methodology and structure that YouthCAN has developed, as well as the best-practices and outcomes from YouthCAN’s work with young activists and creatives. Over the last several months, ISD’s Youth Civil Activism Network (YouthCAN) has made a concerted effort to reach out to young activists and garner important feedback regarding the UN PoA and Resolution 2250 in relation to specific national and regional contexts. 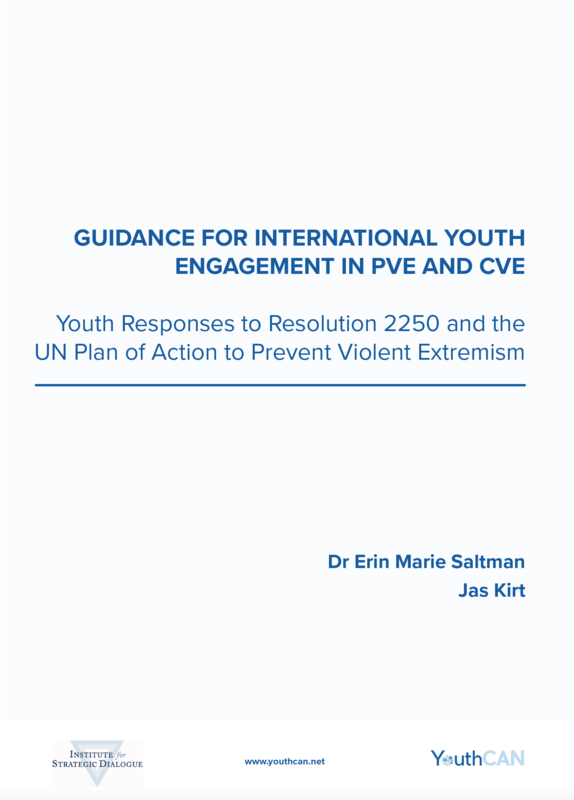 The YouthCAN UN PVE Survey was distributed to young activists between April – June 2016 and contained 25 questions addressing key elements of the UN PoA and Resolution 2250. The survey was distributed online to the YouthCAN network, as well as a range of international youth networks. This report presents the findings from the YouthCAN UN PVE Survey in order to bridge the gap between international policymakers and the expressed needs and concerns of young PVE activists. This Handbook, funded by Public Safety Canada through the Kanishka Project, was created to help anyone looking to proactively respond to extremist propaganda with counter-narrative campaigns, and is intended as a beginner’s guide for those with little or no previous experience of counter-narrative campaigning. It takes readers through the main stages of creating, launching and evaluating an effective counter-narrative campaign. 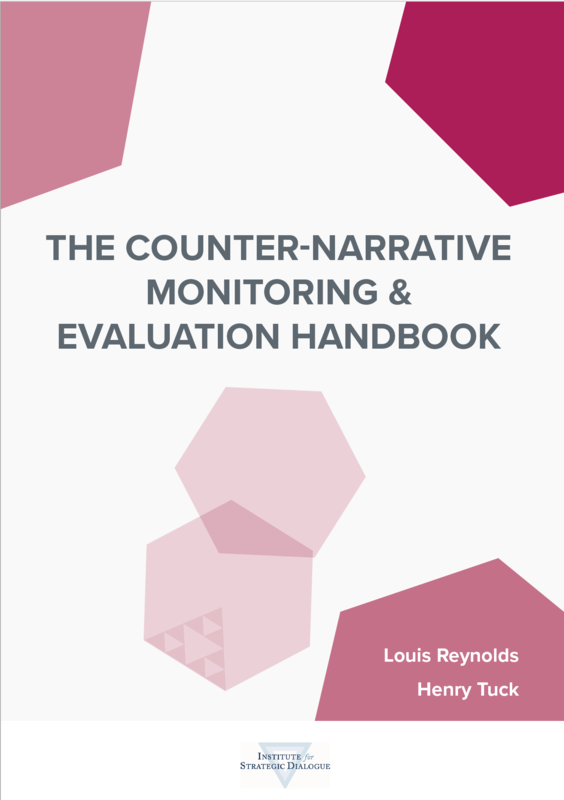 It can also be used alongside ISD’s freely available online Counter-narrative Toolkit, which can be found at www.counternarratives.org. A systematic analysis of lone-actor terrorists reveals considerable variation in terms of individual characteristics, methodologies, motivations and indicators of violent intent. 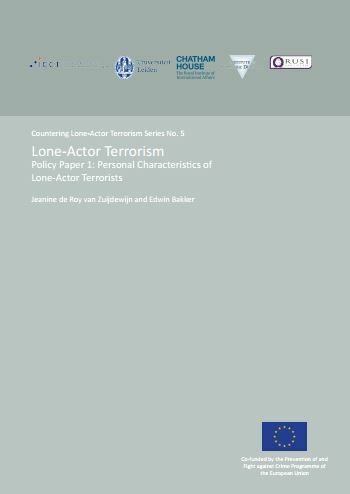 This fourth policy paper of the Countering Lone-Actor Terrorism series examines how lone-actor terrorists reveal their intent to commit attacks and recommends a targeted approach based on the characteristics and motivations of the specific threat. 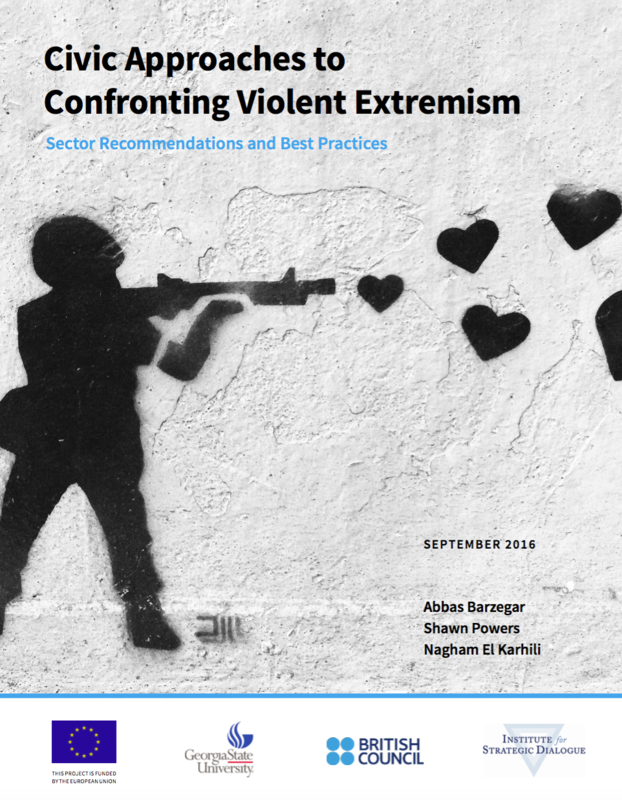 This policy paper makes three key recommendations to European governments and global social media companies based on data collected during the Countering Lone-Actor Terrorism project undertaken by a consortium of partners (RUSI, Chatham House, Leiden University and the Institute for Strategic Dialogue). This research brought to light the significant threat posed by right-wing lone-actor terrorism, as well as the need to continue infiltration and monitoring of violent extremist groups. The paper also recommends that social media companies continue to improve user-based reporting systems to expedite responses in potential cases of lone-actor terrorism. 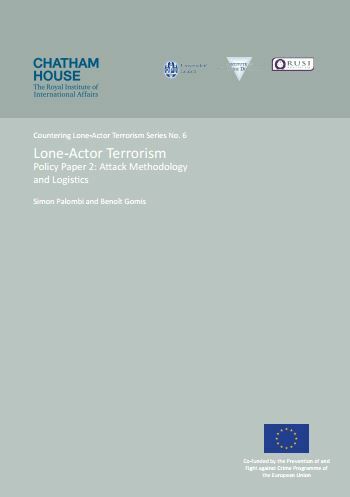 This second policy paper of the Countering Lone-Actor Terrorism series examines the key variables relating to attack methodology and logistics, and suggests policy recommendations based on the analysis. This policy paper emphasises the importance of focusing on different subgroups and of benchmarking in order to accurately interpret results. Likewise, they underline the necessity of lowering barriers to mental health services, as well as multi-agency cooperation. 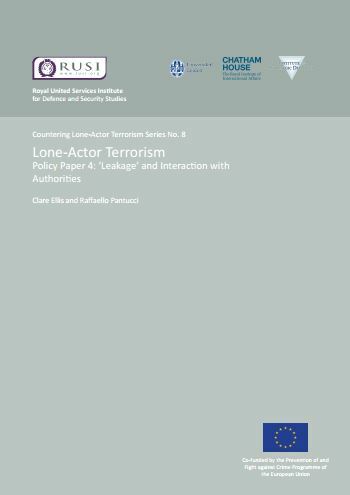 This paper is the third publication in the Countering Lone-Actor Terrorism (CLAT) project. This paper examines the second workshop of the CLAT Consortium, hosted by the Institute for Strategic Dialogue in March 2015, which discussed the development of the project database (based on the definition of lone-actor terrorism agreed at the first workshop) and some of the underlying principles that would inform data collection and retention. 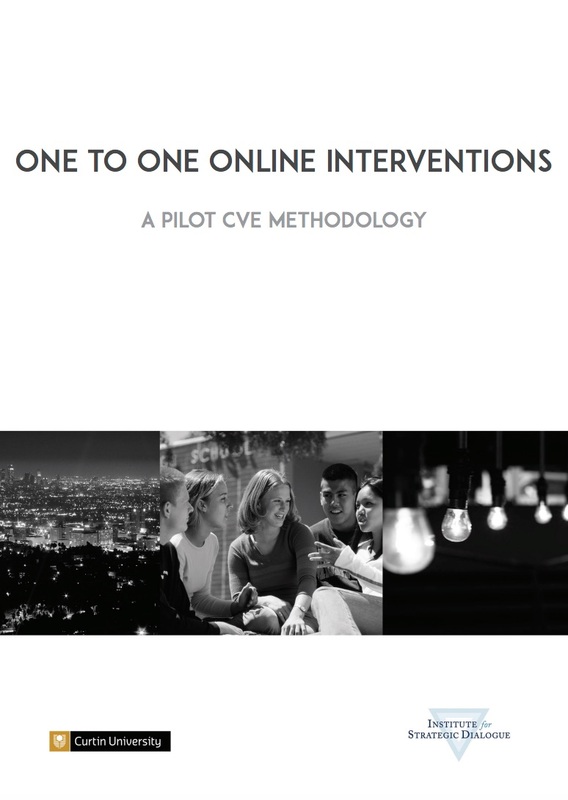 This report outlines the results of the One to One pilot programme undertaken by ISD in partnership with Curtin University and members of the global Against Violent Extremism (AVE) Network. The project aimed to test the viability of an approach based on directly messaging those openly expressing extremist sentiment online and seeking to dissuade them following that path. This report details the results of the pilot programme, outlines lessons learned and invites other organisations to critique these results. 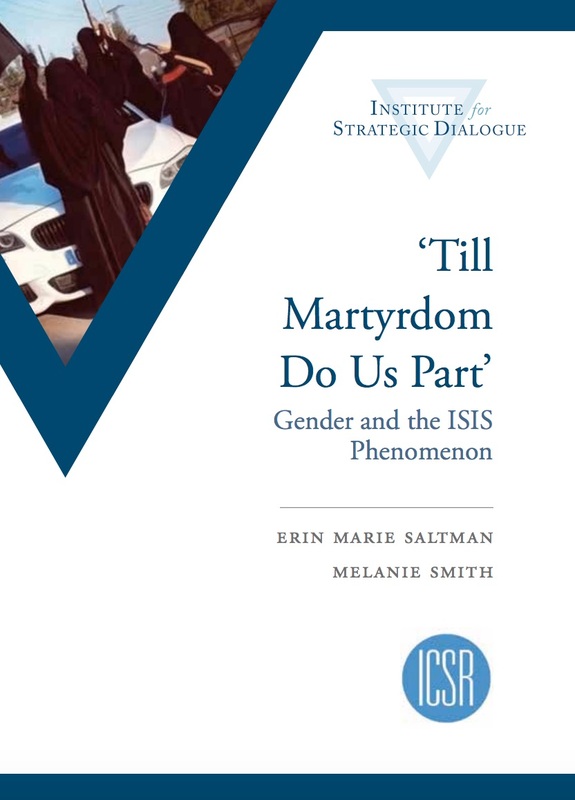 Representing the second instalment of ISD’s Women and Extremism (WaE) programme, this report explores the phenomenon of Western females travelling to Syria and Iraq in support of ISIS. 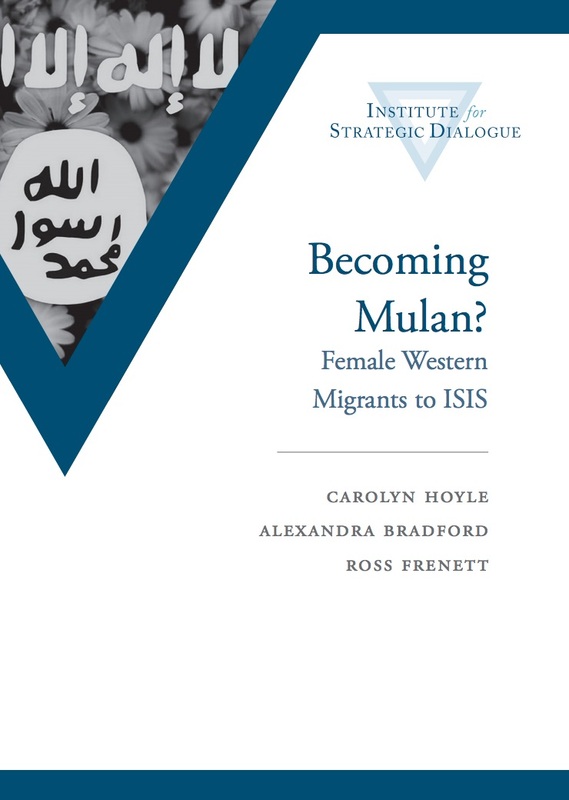 It first elaborates upon the motivations for these women and girls to migrate, explores some of the diverse range of profiles that have been monitored, and clarifies the role that they are likely to encompass once arriving in ISIS-held territory. Additionally, the report aims to elucidate how current government prevention and de-radicalisation infrastructure may be adapted to deal with this trend. 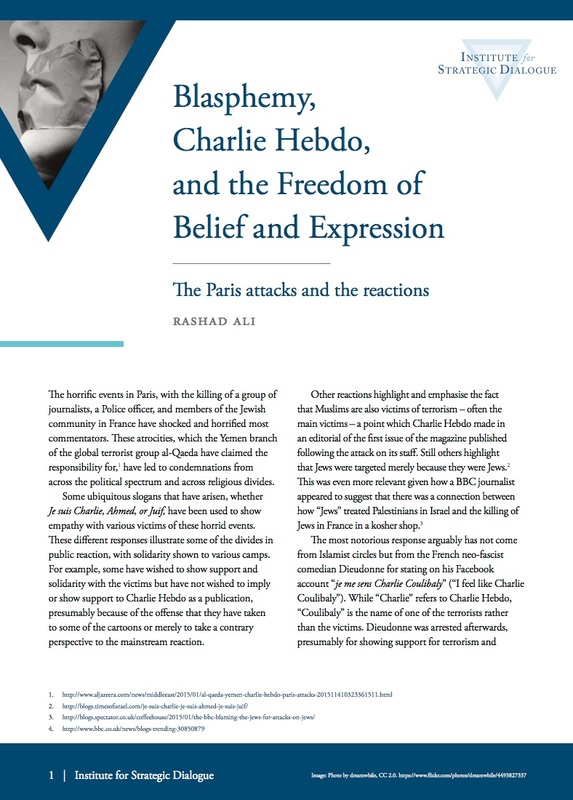 This briefing paper discusses the reactions to the horrific events that unfolded in Paris in January 2015, with the murders of a group of journalists, a police officer, and members of the Jewish community. Responses have ranged from the slogan ‘Je suis Charlie’ to those highlighting the Muslim victims of terror, to those defending the right to get offended and react, but not violence. So what is blasphemous and insulting about these cartoons? Why has such an extreme perspective on speech been used to explicitly justify murder and acts of terror in the minds of the perpetrators? Rashad Ali discusses the inconsistencies and contradictions in terrorist and extremist interpretations of Islam and blasphemy, and demonstrates the need to highlight the ideological flaws in their narrative. The views expressed in this paper are solely those of the author and do not represent those of the Institute for Strategic Dialogue. Launching ISD’s Women and Extremism (WAE) programme, this report focuses on those women that have travelled from the West to ISIS held territory in support of the terrorist organisation. The first in a series of reports, this research draws on our database of known female migrants to ISIS and analyses their reasons for joining the group, the threat they pose and how to stem the flow of women joining ISIS. The security threat posed by so-called ‘foreign fighters’ is an ever-present fear of Western Governments. The departure of European and North American nationals to war zones to participate in conflict or terrorism-related activities presents a number of potential and serious threats. 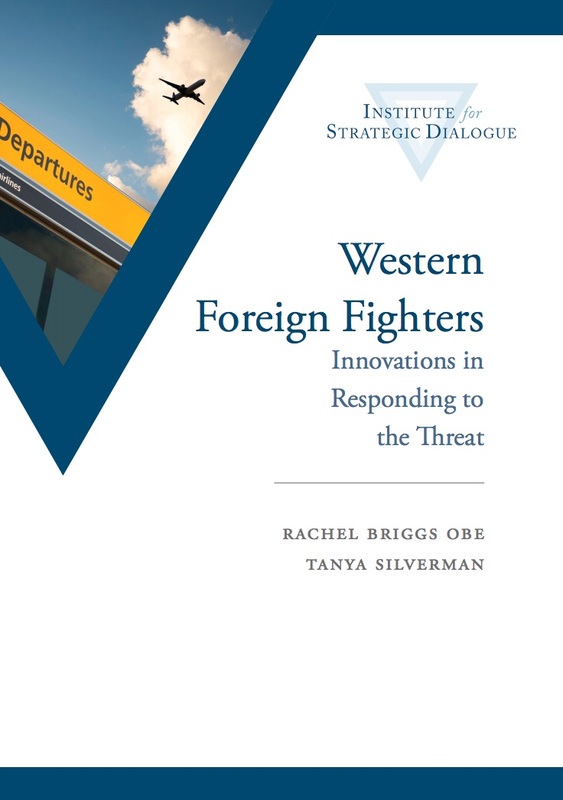 This paper argues that Western Governments in particular need to expand their efforts to develop measures to effectively counter the foreign fighter phenomenon. Existing legal and policing measures should be supplemented by (a) building resilience to extremist propaganda, both online and offline; (b) prevention of travel through interventions; and (c) reducing the risk represented by radicalised individuals upon their return and providing support for their parents, families and wider communities. 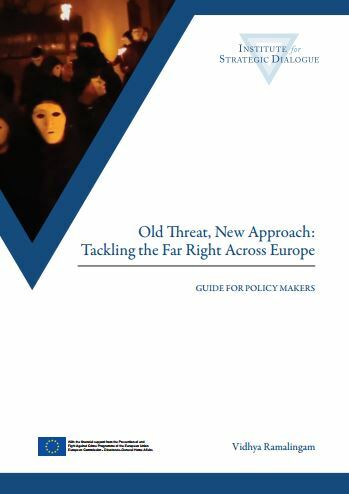 It has developed a package of resources which include the above policy report, Old Threat, New Approach: Tackling the Far Right Across Europe, as well as The FREE Initiative – Far-Right Extremism in Europe, an online resource which aims to inspire and connect those tackling the far right and showcase best practices. Over the course of the two-year project, the partnership carried out research and country visits to identify measures taken by civil society and at the policy level. 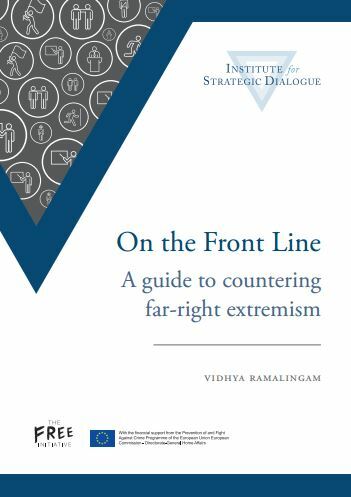 This report is the second in a series of publications to share the key challenges, and lessons learned about what works in tackling far-right extremism.